By popular demand, you can get the best of our SharePoint Framework on-demand video course delivered live and interactively by Andrew Connell! The live course includes 12 hours of instruction over four days (three hours per day) and includes topics covered in our Fundamentals course. As part of the live course you will have the opportunity to ask questions throughout the week from the instructor and author of the course, Andrew Connell. Students will have access to the recordings of this class for 30 days. 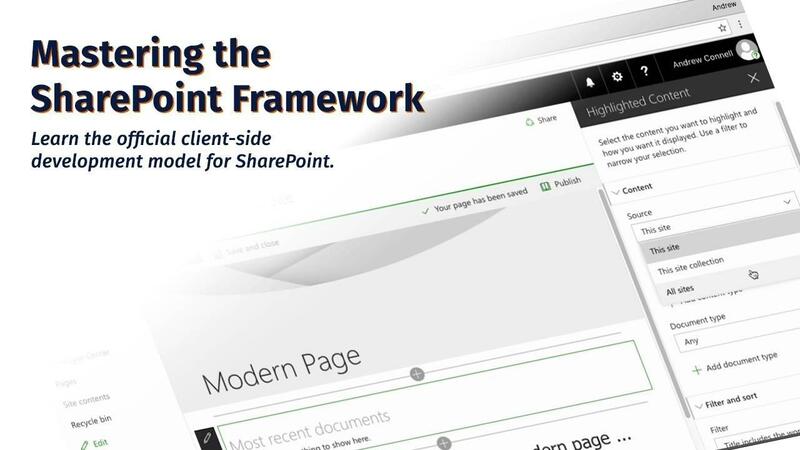 To take advantage of evergreen content and new chapter releases, check out our on demand offerings of Mastering the SharePoint Framework. The course is offered at two different times each day. When you enroll, select the session that works best for you as we're delivering one in the early morning hours (US east coast) that will also work for students in Europe, Asia and Africa as well as a late afternoon option (US east coast) for those students on the US west coast and those in Australia & Asia. The week before the course we will send you details on how to connect (we're using the high quality and reliable webinar service Zoom to deliver the webinar). Furthermore, we have limited the number of students in each session in order to provide the attention each student deserves as part of a live course. Sign up for the mailing list to get notified when new a new live class is added to the schedule, as well as special discounts and deals available only to subscribers! Join Andrew Connell for a live webcast of Mastering the SharePoint Framework on December 17 - 20, 2018! Four days, three hours a day of live instruction, demonstrations and the opportunity to ask questions and get answers to your burning SharePoint Framework questions! Sessions will run Monday - Thursday, 9a-12p EDT (2p UTC). Seats are limited so act now so you don't miss out! Sessions will run Monday - Thursday, 4 - 7p ET (8p UTC / 1p PT) daily.